Are you looking for fun & exciting activities for your children during the upcoming school holidays and would you like other, less privileged children, to have the same opportunity too? Then this may be your chance to get involved & make this possible! Non- profit arts organizations Hand in Hand Creatives, Jungle Theatre Company and partners aim to involve underprivileged children from Capricorn/Vrygrond and other areas in the festival. We will offer them transport, a meal, a children’s theatre performance called ‘Python and the Qunube Tree’ as well as workshops in art, dance, poetry and music. The annual Muizenberg Festival is a celebration of what Muizenberg stands for: A thriving, inclusive community of connected and conscious groups and individuals, who thrive in the idea of a better Muizenberg for all. We are raising funds in order to ensure that children from less fortunate environments are given an opportunity to experience a community festival while feeling included, safe and inspired over the school holidays. We aim to offer a COLOURFUL VARIETY OF WORKSHOPS AND ACTIVITIES FOR CHILDREN everyday over the first week of the festival. Activities include dance, art, music and poetry workshops, as well as a chance to see the theatre production, ‘The Python and the Qunube Tree’. 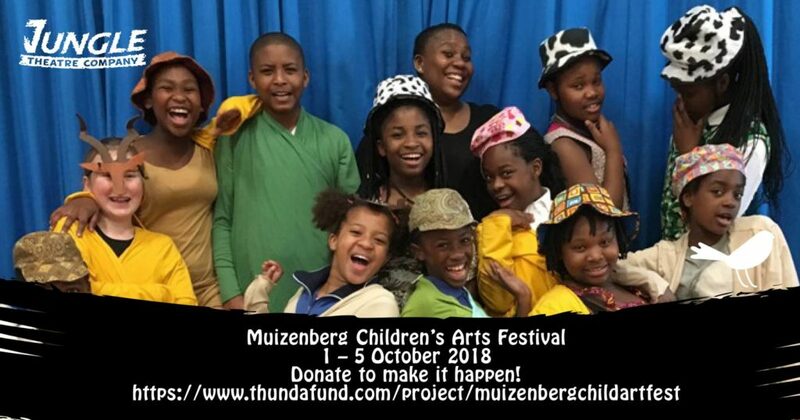 A collaboration of organisations and independent initiatives operating in the Muizenberg area, including Jungle Theatre Company, Hand-in-Hand Creatives, the Muizenberg Youth Project and partners. While each group will offer a unique experience but all with the same intention: to inspire the youth through creativity and play, as well as promoting a vision of an active community of environmentally, socially and culturally conscious people. Besides from the awesome rewards you will receive if you donate a certain amount, you will also be rewarded with a fuzzy warm feeling. A feeling that arises from having contributed towards a vision of a society that values creativity and play as a means to inspire and educate the youth of South Africa in an immersive, inclusive way. Let’s bridge those socio-economic divides and CELEBRATE OUR DIVERSE AND TALENTED YOUTH.